Qualcomm's upcoming 28nm based Snapdragon SoCs, codenamed Krait, are expected to arrive later this year. 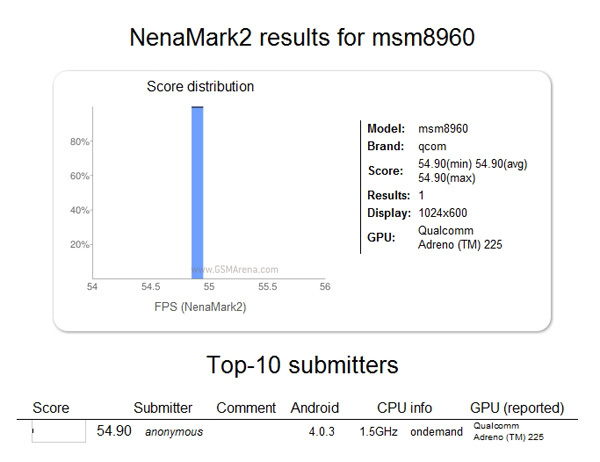 But a NenaMark 2 benchmark score on an unidentified device has leaked ahead of launch. In this benchmark, we see this unidentified device, probably just a reference unit, running the MSM8960 processor with the Adreno 225 graphics. The device has a display resolution of 1024 x 600, same as 7-inch tablets but despite the higher resolution, it posts a rather impressive score of 54.90 in NenaMark 2. To put that number in perspective, we compared it to our own score of the Galaxy S II running the same benchmark. In case of the Galaxy S II, with its Mali-400 GPU and 800 x 480 display resolution, the phone managed to score 46.2. Considering the fact that the Krait processor was running on a higher resolution display, its higher score gains even more significance. Having said that, the Qualcomm reference unit was running on Android 4.0.3, which may have helped it in getting higher scores. The Mali-400 is one of the most powerful GPU available on the market today, overshadowed only by the PowerVR SGX543MP2 in Apple's A5 processor and Nvidia's new Tegra 3. If the new Krait processor can outperform the Exynos in terms of graphics performance, we are really looking forward to see what it can do in games and also how it stacks up against the rest of the competition when it comes out later this year. Thanks for sending this in, Tushar. according to my knowledge, The Exynos 5 series processors are tablet exclusives. My guess is that the Exynos 5' have a massive die. I managed to get 51.9 FPS running a cyanogenmod 9 alpha release on i9100 with NenaMark2. I also got 51.4 fps on Gingerbread 2.3.6. These seem to be very ideal results. Usually i hit only 48 fps.